1st Basebal Card for the K9 Unit. 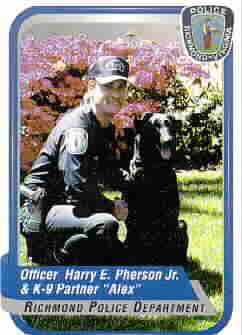 Officer Harry Pherson and K9 "Alex"
Hello and welcome to the History of The Richmond Police K9 Unit. My name is Harry Pherson and I am the author and unofficial historian of the unit. I am a retired police officer of 29 years, 12 of which I spent in k9 as a drug dog handler and during those years working myself into a Master Trainer with the Virginia Police Work Dog Association. I am currently a board member of the Friends of Richmond Police K9 and still work very closely photographing and certifying dogs for the k9 unit. I started this project over 15 years ago while in k9 and it has been labor of love ever since. Through the efforts of past and present k9 handlers and countless hours in libraries as well as family members of former handlers, I have pieced together a fair account of the history of the unit. It is still an ongoing project as time slips away from us but the K9 Unit will always remain a close part of my life and I’m sure the live’s of the former handlers. The Richmond Police K9 Unit was started in the fall of 1957, under the guidance of then, Chief O. D. Garton, Chief of Police for the Richmond Bureau of Police. Sgt. F. G. Clark was selected to head up the program starting with three other officers and himself. The K9 Corps (as it was called then) grew to approximately 23 dog teams over the years. 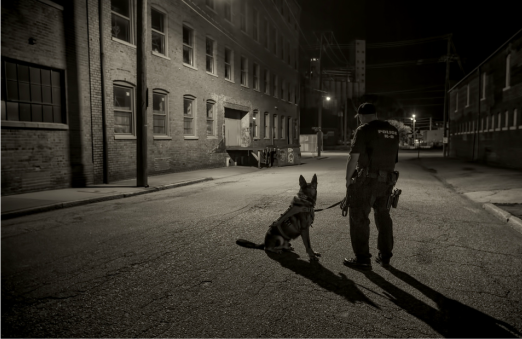 The responsibilities of the K9 Teams were to conduct foot patrols in areas of high crime, respond to insecure building’s to conduct searches, and assist fellow police officer tracking down wanted criminals. 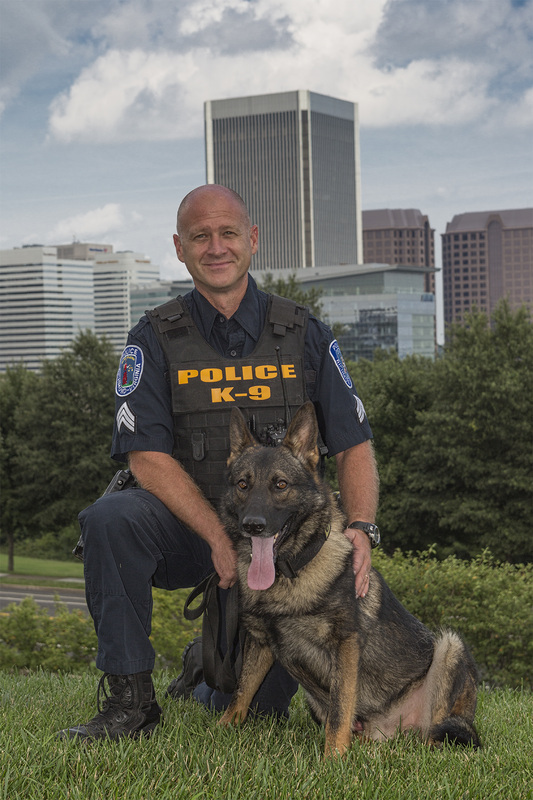 The canine unit over the years has been credited with providing a valuable service to the Richmond Police Department and it's surrounding counties and the citizens of Richmond through public safety awareness and K-9 demonstrations. The K9 Unit today still performs the same duties that it’s predecessors performed over 58 years ago. Currently the Officer in Charge of the unit is Sgt. Michael D. Bohannon. The k9 Unit today has 12 k9 teams. The dog’s are still in demand and are a valuable asset to the Police Department. The criminal element today has gone to great lengths to try and fool law enforcement officers but with the dogs keen sense of smell, it is very difficult to hide anything from them.